Until recently, it was commonly believed that there were just two species of elephant in the world; the African savanna elephant (Loxodonta africana) and the Asian elephant (Elephas maximus). However, after extensive studies and DNA testing, it has been discovered that there is a third distinct species; the African forest elephant (Loxodonta cyclotis). The new species was initially thought to be a subspecies of the African savanna elephant, but DNA evidence shows that approximately 2.5 million years ago, two genetically different strains of elephants evolved in Africa. The forest elephant lives in the forests of central and western Africa where it has lived hidden from view and virtually forgotten. Genetically, the difference between the two species of African elephant is significant – more than half as big as the differences between the African and Asian elephant. The Asian elephant, Elephas Maximus, is found across 13 countries on both the Asian mainland and a number of islands. Asian elephants differ from Africans in a number of ways and recent studies have divided this species into four sub species. Elephas Maximus Indicus is sometimes mistakenly called the Indian elephant, but as it is found across continental Asia as far as China and Vietnam; it should be correctly termed the Asian elephant. Asian elephants are smaller than African ones, with noticeably smaller ears. Only some male elephants have tusks and some females have small tushes. Elephas maximus borneensis, or the Borneo elephant, was only classified as a separate sub species in 2003 after tests revealed differences in the genetic makeup from mainland elephants. 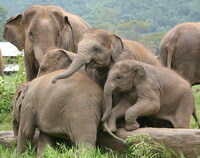 The Borneo elephant is the smallest of the sub species and sometimes referred to as a pygmy elephant. These elephants are only found on the island of Borneo which is shared between Indonesia, Malaysia and the Kingdom of Brunei.